Orphan Black Review: "Let the Children and Childbearers Toil"
The poem “Protest” by Ella Wheeler Wilcox has so far supplied all of Orphan Black’s fifth season episodes with their titles, though none has been as unwieldy or as thematically appropriate to the show as “Let the Children and Childbearers Toil.” Wilcox was a spooky old sort whose only child died soon after his birth and whose passions quickly delved into the occult. Children are also the unwavering potency affecting the Cloneverse, influencing decisions and holding the future in their very genes. Though Clone Club doesn’t consult a Ouija board, they certainly (at least through memory, that most natural of necromancy) commune with the dead. Beth (Tatiana Maslany) delivered advice and the legacy of Kendall Malone (Alison Steadman) lives on in the clones and the organization furthering their experimentation. Those that have cheated death—including many of the corporeal ghosts inhabiting Revival (an increasingly ironic name) like the previously-impaled Susan (Rosemary Dunsmore), held captive by undying anomaly PT Westmorland (Stephen McHattie)—inflict their will upon the still-living and the unnaturally created. Westmorland also wears the tightest pants of anyone in his age bracket beside, perhaps, the members of The Rolling Stones. He maintains control over this life-and-death balance, the oldest man ever to live awaiting his overthrow by the children he helped create. These children, at least the ones in Revival—Charlotte (Cynthia Galant) and young Afghani patient Aisha (Sirena Gulamgaus)—strike out into the woods, immediately increasing tensions for anyone who remembers the antagonist to the season’s previous installment of Clone vs. Wild: a Bigfoot-like (probable) mutant. They find a suspiciously human tooth, shocking absolutely nobody. Gulamgaus, impressive for her age, has a great screen presence and facial intensity. Her ability, even when silent, is put into sharp contrast with poor Kira (Skyler Wexler), who’s asked to act more and more alongside Sarah (Maslany) in this episode. Kira’s going through the kind of sloppily-written puberty analogy that many X-Men go through, during which they discover their burgeoning superpowers in a similar fashion to some preteens discovering their naturally changing bodies. Wexler isn’t given great dialogue to start with and the direction given her character seems focused on the volume of her whines. Siobhan (Maria Doyle Kennedy) and Sarah leave her quickly, however, on a mysterious mission to keep her away from Rachel (Maslany). This quest is made frustratingly dull by the episode’s insistence on secrecy without clues. There’s no fun tagging along on a second-rate Ocean’s heist because the pleasures of that genre come from meticulous writing and the rapidity with which it is executed. Slow teases (especially ones that conveniently introduce new characters) rarely signify anything besides killing for time. This time, the pair embark on a small scam to pickpocket a doctor going through, you guessed it, some mother-daughter issues. In the ensuing olio, Helena (Maslany) gives Sarah an out of character heart-to-heart and the obnoxious Adele (Lauren Hammersley) visits her half-brother Felix (Jordan Gavaris) with a proposal of spycraft. Neither are particularly entertaining or novel, especially since the episode quickly tires of both and returns to Revival so Cosima (Maslany) can join in on Clone vs. Wild. At the same time, Siobhan perpetrates some social engineering to achieve a very silly reveal that puts the nonplussed “oh” in The Island of Doctor Moreau. 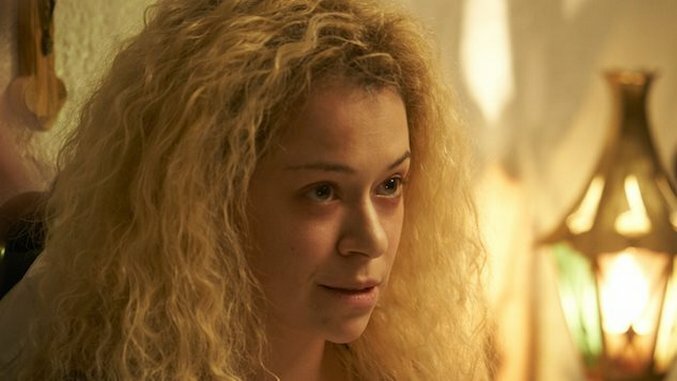 Orphan Black very clearly wants to wrap its puzzle up neatly, attempting to weave and tie off an intricate knot of interconnected characters and dangerous ambition. However, its obsessive rewriting of its own history fleshes out its lore at the expense of tension or progress. And in its final season, the time for laying groundwork seems to have passed. The time for this episode’s emotional and narrative repetition—with multiple characters across the show explaining the same thing to each other in different scenes—is never. If the show can’t trust its audience with its trademark twisted narrative, it shouldn’t have constructed the labyrinth in the first place. With all its talks of legacy, either in scientific achievement or the simple toil of childrearing, Orphan Black refuses to have faith in its disciples.